Why Are You Not Recycling This Material? In the United States, 90 percent of all products are packaged and shipped using cardboard, according to Earth 911; and, as Annenberg Media reports, cardboard accounts for 41 percent of all municipal waste in the United States. Only 25 percent gets recycled, which means that 75 percent of used cardboard ends up in landfills. "Thanks to my mother, not a single cardboard box has found its way back into society. We receive gifts in boxes from stores that went out of business twenty years ago." How Long Does It Take For Cardboard To Decompose In A Landfill? There are many factors that affect how long it takes for cardboard to decompose. It can take years if it is packed tightly in sheets with little surface area exposed to the elements, as in landfills. In a home garden, cardboard used as mulch – shredded and soaked with water – the cardboard can decompose rather quickly and be completely broken down by microorganisms within 3 months. Make crafts! Disney’s Family Fun site shows you how to make everything from racecars, mazes and puppet stages to seats, art galleries and dragon costumes out of cardboard! There are countless fun ways to reuse cardboard in your creative endeavors. Pet Toys! 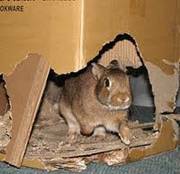 Animals like rabbits, gerbils, hamsters, guinea pigs, mice and rats are easily entertained with boxes to chew. These products are not harmful for animals to shred. If you have cats, you can turn long cardboard tubes into cat teasers or mice toys using these instructions. Breakdance on it! Yes, it’s true – you can recycle cardboard by using it as a practice space for your dance moves. Check out the Vocal Trash crew’s breakdancing skills in this video! Sure, trees may be a renewable resource because we can always plant more, but the decomposition of cardboard releases methane – a greenhouse gas that contributes to global warming. Also, the cutting down of trees destroys ecosystems, where birds, squirrels, and other animals live. Furthermore, processing the pulp and creating boxes consumes energy and releases emissions into the atmosphere. Vocal Trash is a troupe of environmental entertainers who have been engaging audiences with their unique and exciting brand of entertainment for a decade from New York to Seattle. Whether in Madison Square Garden or the Venetian Hotel and Casino, Vocal Trash is environmentally conscious using upcycled materials on stage. The group asks that you "THINK… before you throw it away!" Subscribe to RSS or Connect with us on your favorite networks. Share Your Ideas And Celebrate Earth Day!